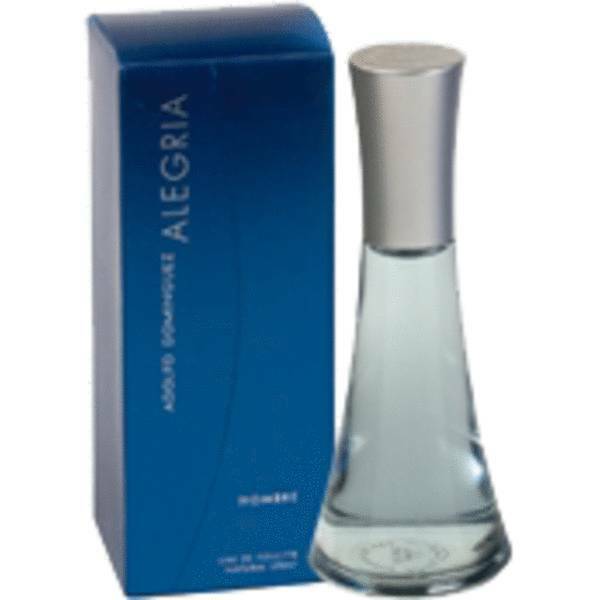 Alegria Cologne by A. Dominguez, Launched alongside the new millennium in the year 2000, Alegria is an A . Dominguez cologne that really highlights what it is to be a modern man. This bold, one-of-a-kind fragrance opens with top notes of Amalfi lemon, yuzu, mandarin orange, galbanum and fresh grass. These then blend into core notes of lime (linden) blossom, calone and ginger. Finally, the base notes include a perfect mellow smoothness in the form of amber and musk, which work with the other, Read More Read More lighter notes to make this fragrance something to truly remember. A. Dominguez, or Adolfo Dominguez, is a Spanish fashion design company with a focus on women’s and men’s clothing items that are both comfortable to wear and stylish to show off ay any occasion. The brightly-colored clothes work alongside the 30+ vibrant colognes and perfumes the brand’s launched over the years to make a wardrobe experience like no other. Alegria is best used on daytime occasions during the spring season, thanks to the many bright, grassy notes used in its formula. All products are original, authentic name brands. We do not sell knockoffs or imitations.